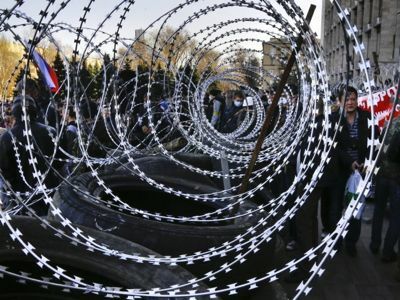 The situation of human rights in Ukraine has deteriorated markedly since the pro-NATO coup. While the Western media turn a blind eye to this every day reality, Oriental Review highlights thirty particularly significant incidents, revealing that the street is in the hands of Nazi thugs who beat up and kill people with complete impunity. The flywheel of political repressions in Ukraine is gaining momentum these days. In sharp contrast with the liberal approach by president Yanukovych to the “Euromaidan” rout, the interim Kievan administration did not hesitate much about cracking down the public uprising against the “neo-Nazi regime” on the rise in the East and South of Ukraine. Today only in Kharkov at least 70 activists have been arrested during the so-called “anti-terrorist operation” . According to the reports, foreign mercenaries presumably from the US Greystone Ltd private military contractor firm were participating in the operation along with the National Guard (majorly consisting of the ultranationalist Pravy (Right) Sector fighters) and some loyal Interior Ministry units. George Orwell was onto something when he coined the phrase, “war is peace,” to describe the groupthink of his fictional future totalitarian society. He would have no trouble recognizing the propaganda on parade during the recent overthrow of the Ukrainian government, during which “peaceful protesters” engaged in killing, burning, and looting … and continue to do so now. But the coup is not yet over – seizing power is one thing, but it’s something else to hold onto it. And now we’re seeing the inevitable difficulties crop up: a little over a month ago the interim government in Kiev lost possession of Crimea and found itself faced with desperate resistance in Southern and Eastern Ukraine. The new government arrived on the scene brandishing slogans such as: “peaceful protests,” “the struggle for democracy,” and “freedom of speech,” but began straight off with a purge of the opposition, establishing total control over television, radio, and the press, and using political repression to muzzle civil protests in southern and eastern Ukraine. 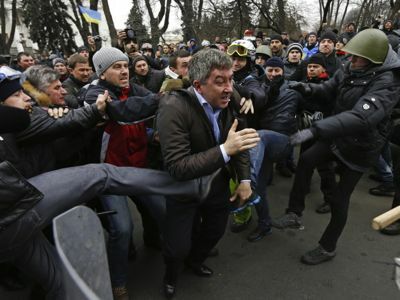 Anti-government protesters attack a deputy of the Party of Regions Vitaly Grushevsky outside the Ukrainian Parliament building in Kiev February 22, 2014. Overt physical crackdowns on any sign of dissent began during the very first hours of the coup: on Feb. 20 the pro-Maidan majority in the Supreme (Verkhovnaya) Rada (Ukrainian Parliament) used violence against the Communist and Party of Regions’ deputies. Many were stripped of their voting cards, which were then used by others to cast the “needed” ballots. Then came an attack on the TV channel Inter , which is watched throughout the country and enjoys the second highest ratings. Armed men burst into the studio in the middle of a live broadcast. The journalist Mustafa Nayyem (one of the organizers of Euromaidan) has already announced the new government’s plans … to nationalize the channel. As you may recall, the TV station currently belongs to the oligarch Dmytro Firtash who was arrested in Vienna at the request of the FBI . What’s priceless of course is that a few weeks before, Mustafa Nayyem and his accomplices at Hromadske (Public) TV (an Internet TV project that was launched using American grant money almost simultaneously with the start of the Euromaidan protests) took the opposite approach, “privatizing” part of the airways at the TV channel First National (which is state-owned). The National Council for Radio and Television (after several unsuccessful half-measures) finally decided to completely ban all major Russian TV newscasts in Ukraine . And all the television broadcasts originating from companies owned by Igor Kolomoisky , Victor Pinchuk , Rinat Akhmetov , and Dmytro Firtash suddenly began working in unison as a well-oiled, centrally controlled propaganda machine. Over the last month there have been dozens of attacks (both physical and cyber versions) on the editorial staff of the opposition media. And on Feb. 27, the so-called People’s Self-Defense seized the office of the Golos.ua news agency, and severe pressure was put on the Ukrainian national TV channel Gamma that works closely with that agency. Soon there was a raid on the newspaper Communist, which is the official publication of the Communist Party of Ukraine. The CPU website is also often down. In the city of Vinnitsa, brazen force was used to seize the local TV station that worked with Ukrainian Communists. The pro-Maidan journalists reported this information with undisguised joy. An attack was also staged on the online publication Ukrainian Krivda, which parodies the pro-Maidan media and fact-checks the made-to-order dogma in their publications. Their website is currently being blocked as well. A group of journalists of Ukrainian Pravda web-site led by the well-known political analyst Vladimir Kornilov was forced to choose between leaving the country or ceasing publication of their articles. They were threatened with savage reprisals and death. The last issue to be published by literally the only representative of the opposition media that is accessible throughout the country, the well-respected and very readable weekly 2000, appeared on March 14. Publication halted because of pressure on its printer, the Press of Ukraine, where the paper is typeset in its usual format. The printing house, which is a state-funded institution, unilaterally changed the conditions for printing the newspaper, placing the publication in an impossible situation. And of course there was the notorious example of the visit paid by several members of the nationalist Svoboda party to First National TV’s office. The beating of Aleksandr Panteleimonov was captured on video and he was forced to write a letter of resignation after being subjected to threats and violence. Although the Western media wrings its hands over the alleged “human rights violations in Crimea,” international observers are seemingly too busy to interest themselves in what’s happening in the rest of Ukraine . For the curious, here are some facts that represent only the “tip of the iceberg” of political repression in Ukraine. On Feb. 22 the first secretary of the Lvov Committee of the Communist Party of Ukraine, Rostislav Vasilko, was falsely accused of “firing at Maidan” and subjected to brutal tortures . According to eyewitnesses, he had needles shoved under his fingernails, his right lung was punctured, three ribs, his nose and other bones in his face were broken, and threats were made to wipe out his family. He is currently undergoing medical treatment in Russia. On Feb. 23, Alexander Pataman, the leader of the antifascist People’s Militia of Zaporozhye, was kidnapped. On February 24, six members of the Constitutional Court of Ukraine were voluntarily sacked by the Supreme Rada “for violating the oath” . Some of them were subject to threats and physical coersion. Three days later the expelled judges adopted an appeal to international human rights institutions . On March 5, Andrei Purgin, one of the leaders of the pro-Russian organization, the Donetsk Republic, was captured in Donetsk and taken to an unknown destination . The kidnapped man’s friends claim that he had received a visit the previous day, during which he was warned, “if he stays home today, his wife won’t become a widow,” but because others were expecting him, he went on to the public square anyway. Andrei’s fate is now unknown. On March 6, Vladimir Rogov, the leader of the Ukrainian civic organization, the Slavic Guard, was kidnapped. Both are safe at the moment, but were forced to leave the Zaporozhye region and Ukraine. 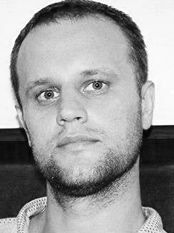 On March 6, Pavel Gubarev, the “people’s governor” and leader of pro-Russian activists, was detained in Donetsk . After being picked up, he was severely beaten, both on the road from Donetsk to Kiev, as well as in the detention facility of the Ukrainian Security Service (SBU). Pavel fell into a coma in mid-March and currently remains in a prison hospital. Because of fears that his condition could be made public, he is not being allowed access to a lawyer. His wife Ekaterina and three young children were forced to leave Ukraine after her husband’s arrest. The “people’s governor” of the Luhansk region and leader of the Lugansk Guard, Alexander Kharitonov, has been under arrest and held in an SBU detension facility since March 14. On March 17 the leader of the People’s Alternative, Anton Davidchenko, was detained by the SBU in Odessa, and he is also currently being held in an SBU prison in Kiev. On March 19, approximately 300 armed men in Vinnitsa, led by activists from Right Sector, seized a local distillery belonging to the company Nemiroff . On March 20 a group of activists from Right Sector assaulted some Hungarian schoolchildren who were on a field trip to Transcarpathia from the Hungarian city of Miskolc . Armed extremists broke up a meeting of the Hungarian civic council in the town of Berehove in the Transcarpathian region and beat up the attendees. Two years ago the Ukrainian nationalists desecrated the monument on the Verecke Pass that had been erected to commemorate the passage of Hungarian troops across the Carpathians . They painted “Death to Hungarians” and “This is Ukraine” on the podium. On March 20 four Russian journalists from the Russia-1 TV channel were detained in Donetsk . The Russians’ documents were seized and they were taken to the Vasilievka checkpoint, where they were kept for several hours without explanation before being expelled from Ukraine. On March 20 the Ukrainian Security Service began an attempt to dissolve the Lugansk Guard civic organization that advocates for placing Ukraine under the authority of the federal government and for making Russian a state language. Three activists were arrested and a search conducted of the organization’s offices and its members’ apartments. One of the leaders of its youth wing, Anastasiya Pyaterikova, posted a public appeal on social networks, claiming that the SBU, along with a deputy from the Verkhovna Rada (a leader from the far-right Radical Party of Oleh Lyashko), organized a search for the members of the Lugansk Guard, and persecuted activists and members of their families . VIDEO:Oleh Lyashko, Ukrainian politician, and the leader of the “Radical Party” kidnaps a deputy of the Lugansk city council Arsen Klinchaev. On March 20 a crowd in Kiev, wearing masks and armed with firearms and blades, broke into the building of the Ukrainian State Architectural and Construction Inspection Board. Seizing offices on the seventh and eleventh floors, they pretended to be members of an “anti-corruption committee” and tried to confiscate folders containing archival documents. On March 21 a house in the Kiev region was burned that belonged to Viktor Medvedchuck, a leader of the Ukrainian Choice movement. On March 23 Euromaidan activists in Kiev attempted to occupy the building of Rossotrudnichestvo, a Russian agency that promotes ties with ethnic Russians abroad, and the car of one of its employees was stolen. This stunt was intended to confiscate that office space and use it to house the headquarters of the People’s Self-Defense of Maidan. On March 23 a group of Right Sector members armed with machine guns stormed a concert in Rovno that was being held as part of a local rock festival, brandishing their weapons and dispersing the attendees. On March 23 in Zaporozhye, a few dozen militants, known as the Self-Defense of Maidan, attacked the participants in the Melitopol-Zaporozhye Friendship Road Rally with sticks, stones, and iron rebars. People were beaten and cars were damaged. On March 24, members of the Ukrainian border service once again forbade Aeroflot crew members from leaving their aircraft during stopovers at Ukrainian airports. No explanation was given. This type of discrimination on the part of the Ukrainian border guards, which has occurred several times in the past month at the airports in Kiev, Donetsk, and Kharkov, is in violation of accepted international practices and poses a danger to civil air traffic. In recent days, Ukrainian border guards have forcibly turned back large numbers of air travelers from Russia. Forty-three such cases have been reported at Aeroflot alone. In 32 cases, Aeroflot was compelled to repatriate passengers at its own expense who had flown to Ukraine on one-way tickets. Since mid-March at the Kharkov section of the Russian-Ukrainian border, Ukrainian border guards have stopped Russian citizens from entering Ukraine, each day turning back 120-130 people. On March 26, Right Sector supporters in Dnepropetrovsk, Donetsk, and Kharkov physically assaulted anyone they found in the streets wearing the honorary St. George ribbons (the symbol of Soviet victory over Nazism) . On March 26 in the Kirovograd region, representatives of the local “people’s council” and members of the Svoboda party attacked the chief physician at the Ulyanovsk Central District Hospital, Aleksander Tkalenko, attempting to beat him in his own office . The doctor’s only “sin” was his political affiliation (he was a member of the Party of Regions and had been appointed to his current position by the Yanukovych administration). On March 26, the former mayor of Mirgorod (in the Poltava region) and chairman of the town council Vasily Tretetsky died in the hospital after being beaten and shot by assailants on March 16 . On March 26, activists from the Avtodozor social movement together with a hundred of militants from the Self-Defense of Maidan, picketed the offices of Russian banks on Kreshchatik street in Kiev (VTB, Alfa, Sberbank of Russia, and Prominvest), demanding that they be closed and all their Ukrainian divisions nationalized . The Sberbank building was seized and looted. The ‘last and categorical warning letter’ sent to Rev. Alexander Shirokov by the Ukrainian Nazis urging him to stop “Moscovite propaganda” under the death threat. The threats to Russian Orthodox priests is also a regretful commonplace in today’s Ukraine. The case of Rev. 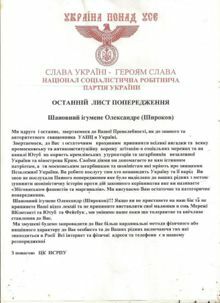 Alexander Shirokov, persecuted by non-registered National Socialist Workers’ Party of Ukraine, was made public thanks to the special statement of the Russian Ministry of Foreign Affairs . The great number of other, less publicized cases of pressure imposed against the pro-Russian priesthood by the radical elements and local administrations loyal to the central Kievan interim authorities, are taking place. Given this climate, the pro-Russian intelligentsia in Ukraine continues to emigrate en masse to Russia (including to Crimea). According to the latest data, more than 30,000 people have been forced to flee their own country, which has been taken over by nationalists. We can only guess at the source for the reports by international human rights organizations, since they document only the non-existent “violations” committed by one side – the Russians – while completely ignoring the instances of egregious anarchy so often found in Ukraine today. In any event, it is clear that under these circumstances, what are being billed as the Ukrainian presidential elections cannot be held in anything resembling a normal atmosphere on May 25, and no ballot-box returns during this crisis will be recognized by Russia, the country that the majority of Ukraine’s citizens are counting on.